After using an M7 with a custom ROM and Sense 6 for a few weeks the good battery life I'm getting on the M8 is no surprise. What is surprising is that with this bigger CPU and slightly bigger battery I'm getting better battery life. Imo, the complaints about a 2,600mAh are unwarranted. How is your battery life? cizzlen and roflwaffleton like this. So far, battery life has been fantastic compared to my M7. I don't have an exact number on how much better, but their claim of 40% better is definitely a reasonable number. I'm not trying to argue, but I can easily get a full day's worth on my M7. Were other people having problems with the battery life on the original One? Or is it just better overall which is of course a good thing? There were a lot of negative posts about this phone based on the size of the battery all over the internet. People complained that 2,600 wasn't enough, it needs at least 3,200, etc... Just want to let people know that battery size in this phone should not deter you from getting it if it's on your list of 'Cons'. cizzlen and Aquila like this. So far I'm actually really disappointed in the battery on my Verizon M8. It doesn't seem, at least in the first couple of days, to be much better than my M7 was getting. I've disabled bloat ware apps and I'm watching wifi/Bluetooth use, but I'm dropping more than 10% an hour with nothing more than texting, refreshing Facebook and Falcon Pro. Screen set to auto. Right now GSAM says I've dropped 12% in the last 51 minutes with 30 minutes screen on time. 12% for 30 minutes of screen time? 4 hours of screen time...not bad, but I'd give it a week to see how it is. I remember my One's battery performing horribly when I first got it, but it got better. Just make sure to check the wakelocks and to see how much the android OS is taking up of the battery. Now this is what I'm talking about, and with heavy usage. A lot of pictures and using GPS. Definitely better than my 5S by a mile. cizzlen and msavic6 like this. Of course they said 3000 was minimum, and that is true. HOWEVER, that is needed for underperformed processors. It's a matter of time. As technology improves, we transform the way things are done. More efficiency translates to less work. Battery needs, produced heat, etc will all get better with the M8. You should make sure your location services are on battery saver. Email is set to sync less. You know, most emails are set to check new mail every 15 min. That's 96 times a day! Check it out adjust the settings, and let things settle. Granted I haven't used the phone much today. 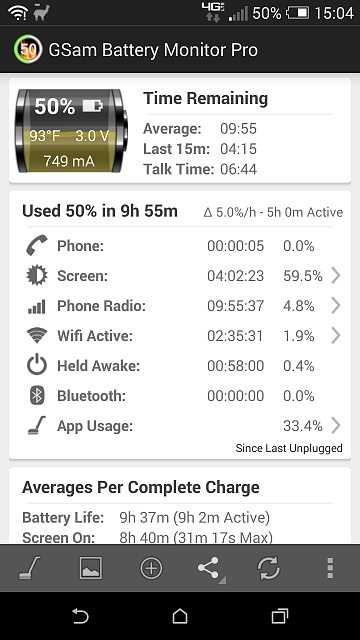 I am currently at 8 hours and 8 minutes with moderate usage and have 68% of my battery left. The battery life is very good. I just switched from a Droid DNA, and I can tell you that I am usually at about 35% at this time of the day. KSDroid01, droidman2177 and cizzlen like this. Holy cow! Is that a Verizon model getting those numbers? If you are referring to my post above, then yes, it is a Verizon HTC One M8. Turn off auto brightness. I went 14 hours last night before plugging in and was only at 49% with moderate usage. I'm typically a heavy user and swapped from a note. Battery is performing better than my note 3s did. My One X is dead after 3 hours of browsing so anything above that would be wonderful for me. That is exactly how my Rezound was, even with the extended battery. Absolutely ridiculous, would never have expected that kind of screen on time. Remember last year when we thought 6 hours on our S4 was good? Haha. Still using Battery Guru? Verizon M8 and it's surprisingly good! Former DROID MAXX user so I was a bit worried about battery life. Note 3: Is my overnight battery drain normal?